Comments: Deciduous broadleaf from Argentina and Brazil. Distinctive thorns at base of tree and among the branches easily sets this tree apart. Pink flowers in Fall, and seed fiber is used for kapok. 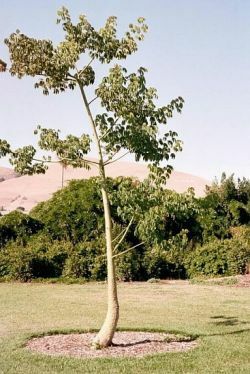 Specimen tree is 7' but mature trees can be 200' or more in height. A distant relative to the Baobab of Africa.